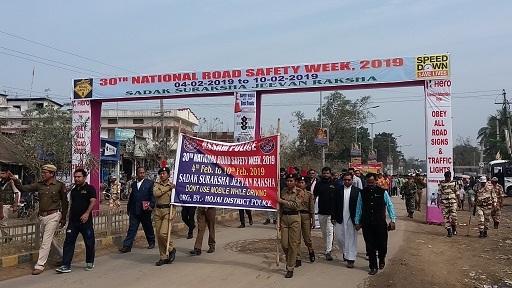 The 30th Road Safety Week was observed by Hojai District Police on Saturday in Hojai of Assam. Road Safety Week is being observed from February 4-10. The theme of this year is ‘Sadak Suraksha-Jeevan Raksha’. On this occasion, a bike awareness rally was flagged off by assistant superintendent A Basumatary in front of South Division Forest Office campus. The rally went to Nilbagan and came back to same venue. After this, a procession to generate awareness on traffic rules was flagged off by the vice-principal of Don Bosco High School Father Adwin along with senior journalist K D Goswami. The procession started from South Division Forest Office in Hojai to Netaji Point During the course of the procession, chocolates and pamphlets on Road Safety were distributed. The procession traversed the main thoroughfares of the town. Students of Markaz Academy, Don Bosco High School, Hojai Girls College, Staffs of Hamm Hospital and others participated in the procession. Talking to media, ADC A Basumatary and OC Kiteshwar Banyia urged the denizens of Hojai district to obey traffic rules to avoid accidents.